Durga Puja—24-28 September—has a mood-enhancing ring to it, not only for Bengalis in Kolkata and elsewhere, but also for the West Bengal Tourism Development Corporation (WBTDC), which has discovered a money-spinner in pandal tours over the five festive days. Beginning this year, the new, improved tours will depart from the Netaji Indoor Stadium (instead of the WBTDC’s Dalhousie office)—that is, all tours except the Salt Lake and East Kolkata tours (covering Lake Town, Sribhumi and Dum Dum), which will leave from, and return to, the Salt Lake stadium. There are a variety of city day-tours on offer, segregated according to special interests, localities and puja-specific occasions. On the Udhbodhoni trips on Panchami (23 September) and Sashthi (24 September), experience the bustle, which is part of the preparations to the unveiling of the goddess and her subsequent worship. The Puratani tour covers very old community pujas of north Kolkata, such as Kumartuli (also the hub of the idol makers), College Square and Telengabagan. Then there are the localized tours: Dakshinee takes you to the celebrated community pujas in Ekdalia, Badamtala, Mudiali, Bosepukur; Purba will pack in the magnificent pandals of Salt Lake—over the years, they have replicated Hogwarts Castle, the Titanic and Madurai temples— and eastern Kolkata. I recommend the Sanatani tours, covering traditional pujas in aristocratic households over morning and afternoon sessions. I undertook the morning tour last year and learnt so much about the city’s heritage. Our guide, drawn from a pool of government of India-approved guides, was well informed. The aristocratic Kayastha families of Deb, Dey, Mitter, Dutta of north Kolkata localities such as College Street, Beadon Street and Shovabazar, married into each other, thereby succeeding in controlling much of the trade and commerce under the British Raj. The only exception was the Brahmin zamindari of the Sabarno Ray Chaudhury clan at Barisha on the southern tip of Kolkata: This puja, which started around 400 years ago, is older than even the city by nearly a century. 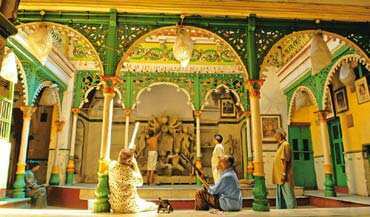 WBTDC also offers a trip to Kolkata’s outskirts, to countryhouse pujas such as in Guptipara, near Burdwan. Around 62 coaches, ranging from 40-seater non-AC buses to air-conditioned Volvos, are used for the tours. River trips on the Hooghly are also available from 25-27 September, for Rs500 and Rs800 for morning and night sessions, respectively. City tours (25-27 September) cost between Rs400 and Rs800, inclusive of traditional snacks and lunches. Outskirts tours cost Rs1,500 for non-AC vehicles and Rs2,000 for AC coaches.